Over the Thanksgiving holiday of 2013, Chrystal Smith took a trip to Mexico that dramatically changed her life story. Her family traveled to Reynosa just across the Texas border on a church mission trip where they encountered people who had very little but taught her more than she could have ever imagined. She recalls a little boy who gave her child a tattered toy car to thank him for a gift. It was likely the only toy the Mexican child had. Smith returned to the United States on the shopping frenzy of Black Friday, and she immediately knew priorities in her family had to change. Then Smiths stepped outside their box and became foster parents within five months of their Mexico journey. In that short time, they went through required state training, and their foster child arrived at their door on April 28, 2014. The Smiths spent their first day with the little girl driving all over town buying clothes and supplies she needed. 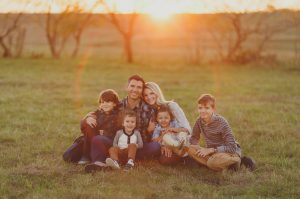 It was at that moment Chrystal says God planted the seeds for what would become Foster Village: a nonprofit organization in Austin, Texas that provides a connectional community for foster families. 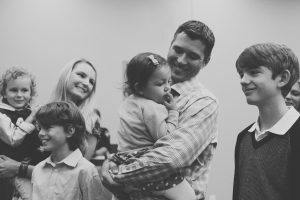 Smith and her family quickly connected with other foster families, and immediately realized their huge needs. As of August 31, 2015, there were 16,378 children in foster care in Texas (Texas Department of Family and Protective Services) and a tremendous lack of foster parents. By early 2016, with her husband, 3 sons and newly adopted daughter from the foster system, Carla, the nonprofit Foster Village was born. She put out the call to friends and her community and donations started pouring in. Foster Village began collecting items to take to foster children when they first join a family, so they could spend those precious early hours together getting to know each other instead of shopping for necessary supplies. 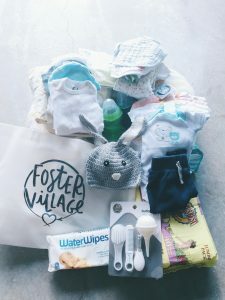 The Foster Village Welcome Packs contain things like clothes, pajamas and toiletries. Foster Village sometimes delivers cribs and car seats as well. The organization grew on its own in just a few short months. A local storage company offered a storage unit too keep all of the item in that are used for the Welcome Packs. Smith partnered with area group homes like the Burke Center for Youth where foster children live before placement in the system. Foster Village delivers Welcome Packs to those children too, even before they are placed in foster homes. All along her two year journey, Crystal felt a special connection to every foster child she has met, because her story is similar. She says she grew up with an abusive father that gives her an understanding of what many foster children experience. Chrystal’s educational background also prepared her for this unexpected organization. 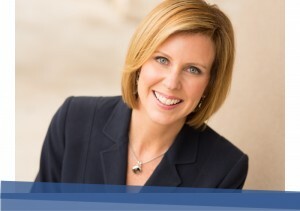 She has a degree in Child Development and experience working with parents who are dealing with vulnerable children. In less than one year, as the word has spread about the Smith’s efforts, the Foster Village has expanded. The storage unit for Welcome Pack items has doubled in size. Volunteers partner with more group homes to provide additional support. At least one judge in the Travis County court system is referring foster families to the Village for help.